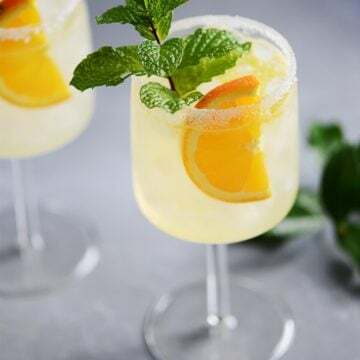 Make this classic Margarita cocktail recipe at home with only 4 ingredients: tequila, fresh lime juice, simple syrup, and a splash of triple sec. The classic Margarita is very popular and often requested in most bars and now you can make them at home! You will love it! I can’t believe that I never shared this recipe for my classic margarita! My husband perfected this recipe a couple of years ago after seeing a bartender make it at the Ritz-Carlton in Tucson AZ. He told us the secret to the PERFECT margarita! The key to the perfect margarita is to mix equal parts FRESH lime juice and simple syrup & a splash of triple sec. Most classic margarita recipes call for a lot less simple syrup and sometimes too much triple sec. It’s also important to make sure to fill your drink glass with ice almost to the top. Otherwise the mixture of lime & syrup will be too sweet. I’m often asked what is the best tequila. The best tequila is a matter of personal preference. And yet it’s an understandable question as there seems to be a new tequila on the market every day! Personally we drink blanco or reposado. The only suggestion we have is to stay away from cheap tequila unless you want to remember your college days and the reason why so many people fear tequila. There are a lot of good tequila’s out there in the $30-$35 price range that will do the trick! To make the margarita mixture, combine the lime juice & simple syrup in a large glass. Fill two cocktail glasses with crushed ice and add the margarita mixture leaving some room. Add 1.5 oz of tequila to each glass (one shot glass) and a splash of triple sec. Optional: Rub the rim of four 10-ounce glasses with a lime wedge and dip in salt prior to filling it with crushed ice.